NEW YORK – Cyber Monday is off to a big start – with retailers looking to woo customers to their websites to get what are being touted as amazing deals. Those retailers are pulling out all the stops and using social media in a way like never before to promote their products. 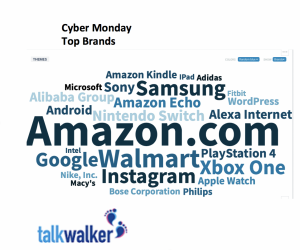 According to international social media analytics firm Talkwalker, there have been more than 1.1 million mentions of Cyber Monday in the last 30 days, including over 430,000 mentions in the last 24 hours. While Cyber Monday is looked at as a U.S. phenomenon, the hashtag #CyberMonday was also mentioned hundreds of thousands of times in Europe, Talkwalker reported.